"Ram were a relatively unique thing: an early 70’s US progressive band that created material which compared favorably to that of their British and European brethren. Definitely obscure, the information on the band is sketchy to say the least, other than their being a quintet* from New York who released this, their only album, in 1972 and then promptly disappeared. The sleeve depicts a brain scan photograph forming the shape of a ram's head and horns, surrounded by a field of stars. Yeah, that's right, cosmic stuff in its implications, and pretty descriptive of the band's sonic palette. It's difficult to describe Ram without drawing comparisons with some other bands. In the process, you, the reader might be tempted to write them off as being derivative, which would be quite unfair. I have seen them compared to Felt and Freedom's Children, but since I have yet to hear those bands, I'd describe them as a psychedelic cocktail made up of a base of Spirit with a large infusion of Nektar and just a dash of groin-grinding Guess Who, served up by your bartender, a certain Mr. J. Hendrix. Yes, this was most definitely an American band, but one that retained an edginess on vinyl that sometimes was lost by their overproduced peers. 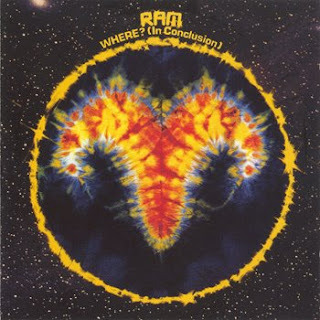 Ram had that in-your-face boisterousness of American rock going for them, as demonstrated by the tight and aggressive album opener, “The Want in You”. But they also had a spacier and gentler vibe. Indeed, part of the beauty of this album is in their ability to switch from head-banging intensity to a gossamer-thin flute-driven sweetness, on the fly. The same band that could produce the Hendrix-tinged (and one hopes ironic) band-of-horny-gents-on-the-road song, “The Mother’s Day Song” (“Momma told me tomorrow's Mother's Day/So if you wanna be a Momma come up to my room and play”, lol), also deftly created a quite beautiful flute-led instrumental and a bona-fide sidelong prog epic, taking the listener through a multitude of emotions in 20 minutes of psych-heaven. Here the band recalls the best of early Nektar while maintaining it's own identity. Ram were inventive. Creative use is made of the bass as lead instrument on both album sides, while ripping guitar passages can bring the music to the edge of chaos prior to the flute pulling us back from the brink of an adrenalin overdose, and into more airy territory. Strategic use is made of the much-maligned vocoder on side two's “Aza”, as well as some unusual mixing that sometimes place the keyboards and wind instruments prominently above the guitar and rhythm section to great mind-expanding effect. The mantra-like opening section of this song is quite sublime, and the only gripe that I have about the piece is that it seems to run out of steam towards the end, almost as if they didn't know quite how to end it. I’m not about to go out and declare this to be a lost classic, but it is a very enjoyable listen that should satisfy the cravings of the psych-space brigade for some time to come. Audiophiles beware, though. It would appear that the original master tapes have been lost since this sounds to have been taken from a mint vinyl copy. The quality is quite good, but there is some surface noise that might bother some listeners. It's a small price to pay for some great music. * Curiously, the album mentions Ron Terry in the songwriting credits, but omits to mention him as a member of the band in the personnel list. Since there is definite evidence of keyboards other than piano throughout the album, I am assuming that this was a mistake and that Terry was the band's keyboard player. The imagination tends to run wild with this kind of information. What was Terry's reaction to being left off the personnel list? Did the resulting squabbles and fistfights lead to the band's ultimate demise? The truth, of course, is probably far less dramatic." (Progressive Ears Album Reviews) Note: This is a review of the release on Akarma - there is no personnel list in the skimpy Lizard Records artwork. Hello anon, anon, & Hallo - you are all welcome! Sorry but the sound is awful.